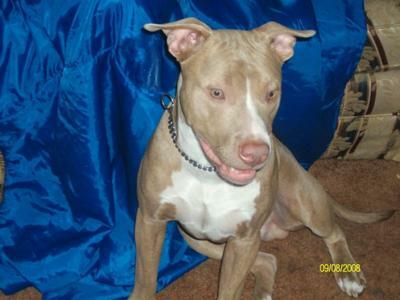 I have a 9month old red noes pit..We got him when he was 6weeks old..And he has been around kids..cause i have a 4year old,3year old,and a 1year old,and he his like my own kid..he minds well he doesn't bite..and the things he does for a treat is he can sit pretty,shakes,it sounds like he says "I want one"he rolls over.I just don't understand why people have to give pits a bad name cause they are not bad its all how you raise them and how you treat them.. It is a terrible thing, but you are right. There are so many closed minded people that only see what society and the media tell them. I have had my pretty pitty for almost 3 years, and he is one of the greatest things in my life. Just like anything or anyone, there are certain things that make him nervous, he's a very hyper fellow, but he is a mush. I have a lab/pit mix also and she is 11 years old. Not until I got my blue pit and walked them together, were people now walking across the street and pulling their children away from my dogs. Meanwhile, they are the calmest dogs and my pit is professionally trained, never pulling or barking. It is going to take a lot of work, but people like us just need to keep being proactive, responsible pit owners. Eventually, I truly feel the true pit bull name and attitude will be known. I don't think that people realize that these dogs are used for therapy, for search and rescue, and as bomb sniffing dogs. We just need to spread the word and keep on doing what we're doing... giving these angelic animals the warm, happy home and families they deserve. Congratulations and your dog and good luck! Online college studies are becoming increasingly popular amongst many students around the globe. Students always use this site http://www.essayzontime.org/ for grow up the communication skill as well as defeated the talented students in study. They may not be expensive compared to the traditional studies but they are relatively efficient because of the flexibility they offer. Any time I would encourage someone to go for them.